You are here: Home / assertiveness / How Well Do You Communicate With Your Boss? 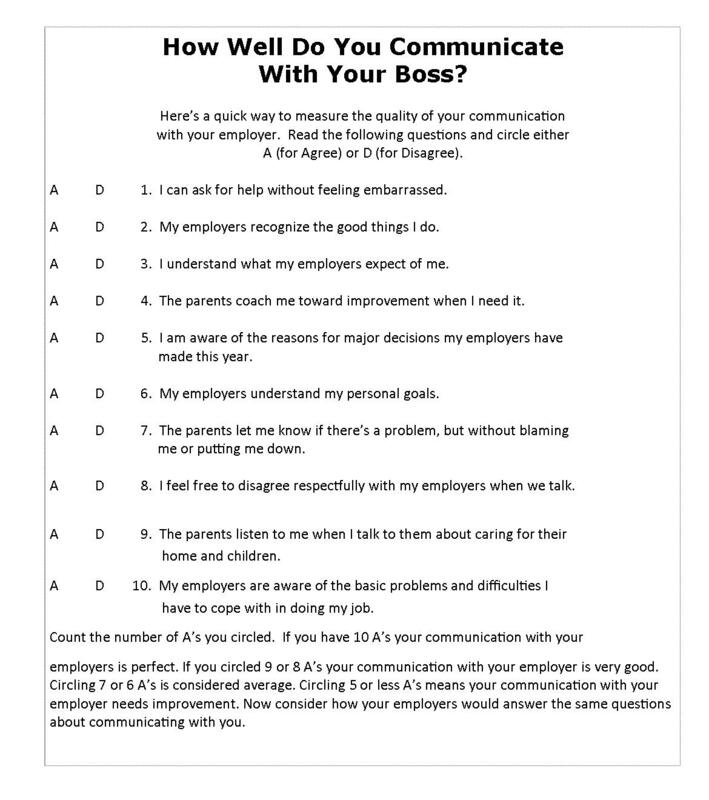 How Well Do You Communicate With Your Boss? Nannies must communicate to be understood. Effective communication with employers is essential so that nannies can avoid misunderstandings and develop trust. Nannies develop trust with parents when they listen to parental concerns, when they speak assertively, and when they keep sensitive and personal issues confidential. When individuals express their wants, needs, and feelings in direct, kind, and appropriate ways they communicate better, feel confident, and are respected and valued. Communicating assertively in a calm, kind, and fair manner connects people bringing them closer to understanding one another. Non-assertive or passive people do not express their wants, ideas, or feelings or they express them in a self-deprecating way. When people do not stand-up for themselves they often feel like a victim and resent others. Aggressive people express their wants, ideas, and feelings at the expense of others. Being aggressive by yelling, criticizing, blaming, or speaking in anger, puts up a wall between people, making others defensive. Active aggressive people direct anger openly towards other people. Passive aggressive people express anger in indirect ways. Nannies are often passive because they want to avoid conflict and they want to be liked by their employers. Some caregivers wrongly believe that nice people do not get angry and don’t show or express anger or bad feelings. But, there is a difference between being liked and respected. Some nannies unknowingly create a role for themselves as passive. Nannies are passive when they don’t know what they want or when they feel their feelings are not important. They feel helpless in their jobs. Once in the pattern of communicating passively nannies may think the parents they work for won’t accept them if they change from communicating passively to assertively. Nothing could be further from the truth. Aggressive behavior often occurs when people naively believe that being aggressive is the only way they will be respected or listened to. It might be helpful to realize that aggressive people typically lack the confidence to appear passive, weak, or frightened. Assertive behavior is saying what you mean and meaning what you say. Being assertive requires considering the other person’s feelings, wants, and needs. Assertive communicators make eye contact and do not apologize for their personal feelings, wants, or needs. Assertive people do not make threats and do not minimize the importance of an issue to the other person. Take the little quiz above to see how well you communicate with your employers. If you do not communicate assertively you can still change your style.